Touch mode is the only time you'll need your stylus to play Tetris DS. The screen and several stories above, are filled with Tetris blocks. You must slide these blocks across the screen to form lines, but as you slide them, more blocks fall down thanks to gravity. The object is to keep clearing lines and not fill your screen up with the blocks that fall from above. The tutorial makes this mode look deceptively easy, but it isn't, if you rush in you'll regret it. Finally, there is multiplayer favourite "push mode". In this mode, you and your opponent play Tetris from both directions, with a few bricks in the middle. Making two or more lines pushes the bricks up towards your opponent, while if he or she does the same, they are pushed in your direction. The game ends when one player is effectively pushed out of the game. This mode can be played against a computer controlled opponent, or preferably a human one. Push mode is fun against the computer, but much more fun with a human opponent. While the new gameplay modes are welcome distractions, as time goes on you'll find yourself coming back to the classic Tetris the most. Nintendo need not feel too bad though, people have tried throughout the ages to improve the core Tetris mechanic, nobody ever succeeded, except once, when somebody somewhere decided to create multi-player Tetris. Tetris DS is a dream come true for multi-player Tetris fans. As well as being able to play push mode, as previously described, traditional two player Tetris is present too. 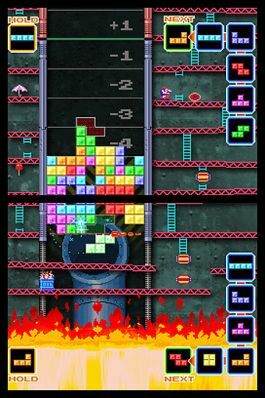 Playing in this mode rewards creating two or more lines at once by sending random blocks over to your opponents side, thus pushing them perilously nearer to the top of their screen. Of course, they can send blocks right back to you too. Tetris DS supports anything from two to ten players, either with a single game card or, should you be lucky enough to find enough friends with a copy of the game, multi card play. As if that wasn't enough, there's also an excellent online mode, where you can challenge Tetris players from around the world. Expect to meet some very competent players if you venture on-line (at least that's what I tell myself when I keep losing).